known as Goddess Pele or Tutu Pele. 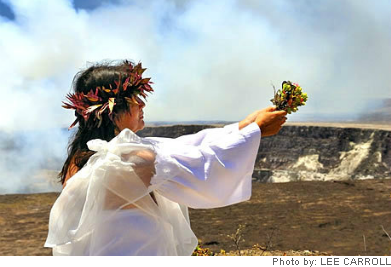 ​You will connect with Goddess Pele and all of Kahuna Kalei'iliahi's ancestors who will be present to honor you for your journey. They will touch you with their love and affirm your purpose here. They will stand before you in the multitudes and weep with joy at your presence before them and what it took to have you there. They will bring to you a remembrance of being here before, because many of you are returning after lifetimes away … some will call this land 'home' for indeed it will be. It is a journey of your Spirit that will be anointed and blessed. Use the contact form below to contact Kahuna Kalei'iliahi to experience your sacred journey... PLEASE NOTE: This journey is currently unavailable.